When we talk about frying anything at home the things come to mind include, a wok filled with oil being heated and then frying your favorite food. The food thus prepared ingests a lot of oil in which it has been cooked, and results into an oily calorie filled diet that would raise your cholesterol and fat level for sure. Now what should be done if you need to avoid this and still enjoy your fried food? The recent airfry revolution has caused many air fryers to sprout in the market to cater to the people’s needs to fry without oil. But the consumers of such machines are still not fully aware of what they are going to get when they’ll buy an airfryer. Due to this, the task of choosing a best air fryer has become an impeccable maze for new customers. Here we are to help you in this task. Below, we are going to describe one of the top air fryers available in the market. 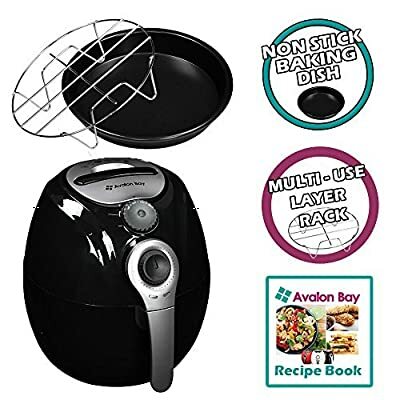 The product we will be reviewing here is the Avalon Bay air fryer.The best solution given has now been the air frying machines. There is a lot of air frying machines that you can find on the market that claim to give you 100% oil free frying experience. Lets have a look into its specs and features along with the usability of this product. – This one has very elegant overall exterior. It has a glossy black out surface made of plastic material. The color and the design, adds value to its appearance, making it gem for your kitchen. – It has compact structure makes it easy to handle and moving from one place to another and also for storage. It would not be a problem if you want to keep it in a standard sized kitchen cabinet. – There is a temperature control dial present right above the front handle and the timer knob. The temperature dial helps you set the exact temperature of the fryer, according to the type of food you are going to cook. – As said earlier, there is also a timer dial that would help you set time to cook the food for 0-30 minutes, according to the nature of the food and the way you need your food to be cooked, either deeply cooked or medium to raw. – The interior parts consist of a mesh basket made of metal covered with Teflon layer, for food to be cooked. It placed above the rack that has a tray below to collect the oil that trips from the food while heating air passes through. – It works using the rapid air circulation technology to provide oil free frying through hot air. Now that you know what is in the box of this air frying gadget. We’d love to tell you about the way it serves and benefits you while you are using it. It is a compact and easy to handle fryer that can be placed, moved and stored with ease. Its very easy to maintain, the inner parts like the mesh food basket and the tray can easily be cleaned and are dishwasher safe. That helps you clean it without any issues. The fryer is easy to operate with easy dials for timers and temperature settings. You can adjust the time of cooking through the timer and also at what temperature you need to cook the food to the required level. It’s very easy to clean and maintain. The removable parts like the basket is dishwasher safe and can be cleaned thoroughly and quickly. You can cook French fries, bacons and any food that you need to get cooked, oil free and to the extent you need it. The rapid air technology uses extreme hot air that moves around the whole chamber and melt down the fats in the food and cooks the food without using any adding any extra oil. It may or may not cook chicken pieces well. And when cooked the chicken meat may feel a little dryer as compared to that which has been cooked in oil. Similarly, other completely raw meat having a considerable thickness would not get cooked completely. There is only instructional manual available along it and no recipe book to assist you in cooking various recipes. If we see through the qualities of this product anyone can get convinced to buy it. just keep in mind that you would not be able to cook completely raw meat and also breaded meat foods, otherwise you can cook any snaks and food you would like.